M76 also known as the Little Dumbell nebula, is in the constellation Perseus. It’s one of the faintest objects in the Messier list. M76 is a bipolar planetary nebula and shines at a magnitude of 10.1. The central star of M76 is mag 16 and is actually a double but was unable to resolve that at the focal length of the image. More good info courtesy of Wikipedia: https://en.wikipedia.org/wiki/Little_Dumbbell_Nebula. Streaming from the Milky Way in Cassiopeia across this area is a good amount of faint Hydrogen emission. 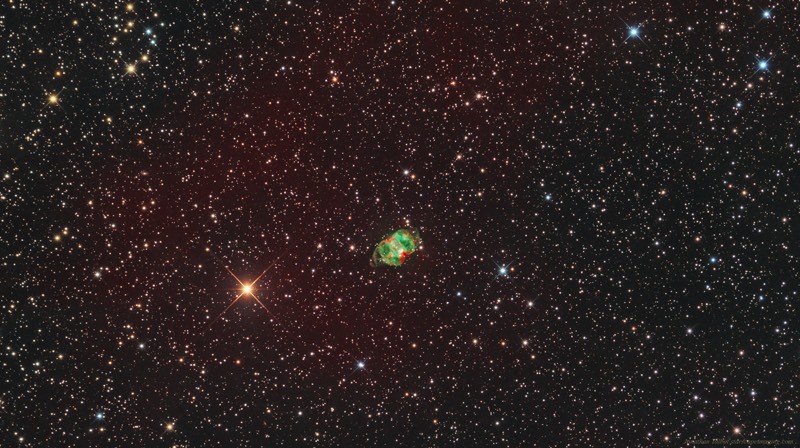 Most images avail on the web, including mine up to this point, do not show this faint hydrogen which shows up as a reddish area in the background. At first I thought this was a false signal but after looking through large survey images of the Milky Way near M76, its apparent that this ionized hydrogen extends down into Perseus and matches directly with the background signal in my image taken using a Ha filter. The image combines 19.3 hrs of exposure time taken from my backyard utilizing Hydrogen Alpha(Ha), doubly ionized Oxygen (OIII) and RGB filters.